Rehearsing ‘Success’ by Nick Drake, July 2010. It’s the end of term. Like most teachers, I’m exhausted but I’ll claim special dispensation: since May half term, I was rehearsing a school play three nights a week, with the occasional Saturday thrown in, and a final fortnight of meltdown. It’s madness to mount a production with fifty Year 8-10 students acting in it at any time, more so in the fraught final weeks of term, when school halls become hotter than Vesuvius, but school calendars are awkward beasts, and fitting in an opportunity for younger students to experience the power of performance is always going to be difficult. So why? 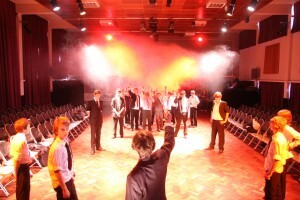 I’ll begin with the truisms: drama teaches commitment, demands of students organisation and fosters creativity. It’s in mounting a large production – with all the inevitable stresses, personality clashes and logistical nightmares – that students start to sense the difficulties of doing something truly grand. Great performances require preparation, planning, energy, reflection, emotional courage and physical stamina. And there’s a trick sometimes missed by English teachers: drama is in effect doing English. As students have delved deep into text in rehearsal, have pondered the creation of character, have thought about the ‘look’ or ‘feel’ of a production, designed posters and written programmes, all along they’ve been doing English. Indeed, in the school in which I teach, as we have rediscovered that link between drama – both extra-curricular and in the classroom – and English, so results at GCSE have risen. Indeed, perhaps much more important than any polished performance on stage is the subtle transformation in students. I’ve directed productions for fourteen out of the last fifteen years, and in that time, many (though not all) of the students whom I know I have taught the best have been those who have got into school drama. Only one has thus far made it to professional acting, though others are in training and still others are now working in theatre or creative industries – but that’s missing the point. More significantly, for a few, it’s kept them out of trouble; for some, it’s been a way of discovering the more enjoyable side of school life; for others, it’s become a way nurturing their creativity. For a significant number, it’s kindled a passion for literature and a sensitivity to language and ideas. And there’s the added thrill of seeing students you have taught read English at university. But for all involved, there is in the school play a shared experience of the sort which binds together communities such as schools. This year, the director’s strops about the positioning of tables on stage have already reached legendary status, and I gather the crew keep a book of things I’ve allegedly said or done in rehearsals. I’ve got to know students in ways quite different from any other activity in school, and they’ve probably seen most of my weaknesses. At times in productions, I’ve wanted to walk away or cancel the whole thing. I’ve fretted and eaten badly, stayed up too late and woken up too early, usually in a cold sweat. But the odd thing is that come opening night, that has all been overlooked, and by the final night, I’m distraught that it has all ended. But I need to take a break from directing school productions for a little while (‘to pursue other projects’ as they say). And more than anything, it is that shared experience that I’ll miss: that sense of working closely with colleagues who have given freely of their time, and students who are anxious to learn and put on a great show, even if in their first production, they don’t quite know what that means. So from me, it’s goodnight and God bless, knowing that some will have caught the bug, and -who knows?- perhaps in ten years’ time, one of them will be directing a school play.